Cimbali has been producing espresso and cappuccino machines since 1912. The extraordinary passion for quality and a renowned talent for innovation led the company to become an ambassador of the espresso coffee culture in the world. Automatic espresso coffee machine equipped with a micro-processor for an easy programming of coffee and hot water dosage. Exclusive thermal system based on a 10 liter boiler, with two traditional Cimbali heat exchangers in series, independent coffee boilers each one with a capacity of 400 cc and a 800 Watt resistor. Water for the coffee is preheated in the heat exchangers, evenly distributed to the coffee boilers, where it is brought to the desired infusion temperature. Equipped with Cimbali's patented Smart Boiler technology, which significantly boosts steam and hot water capacity (+ 30%). New advanced electronics: when equipped with the special kit supplied with the Magnum On Demand Wireless grinder-doser, the machine connects via Bluetooth with the grinder-doser to report any adjustments of the grinding and dose which are performed automatically by the grinder-doser. 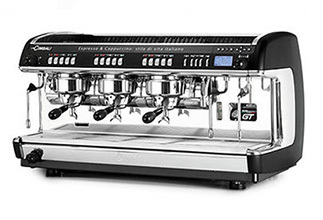 2 standard steam wands and 1Cimbali's patented Turbosteamfor milk frothing and heating without manual intervention.